→ Create the Buttons using CSS. → Create the Slider and links inside it. → Use Stylesheet to position the slider. → Apply the Sliding Effect using jQuery. 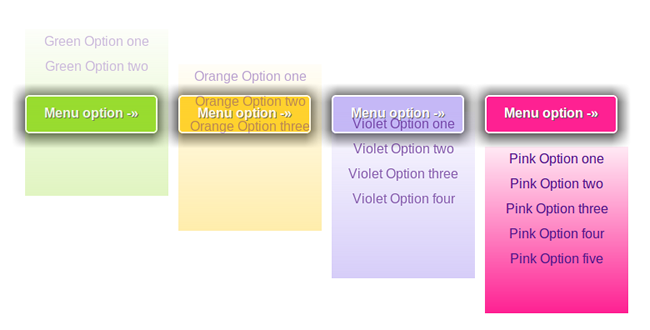 These buttons are created using CSS, they are simple <div> tags. When the button is clicked it gives an impression like it is actually clicked. This Button effect created using CSS. In this tutorial we have used four buttons. So we will have to create four <div> tags and assign class="button" to each of them. These button have different colors applied on them, so we will create four new classes with "color names" and assign them respectively to the <div> tags. To create these buttons just we will create a <div> tag and assign class="button" to it. To assign colors to the buttons we will add another class "color_name" on the <div> tag. We will define these classes in the next step. Note: The two class names are seperated by a space. Note: The class button should come first and then the class color_name. We will now define the class="button color_name" Stylesheet code. First we will create the class="button", and then create the class="color_name"
Then we will concat the two classes using space, and use them as single class selector. We will define seperate Stylesheet code for the active button(When button is clicked), and when it is released. The slider is made using <div> tag. The links inside the slider are kept in seperate anchor <a> tags. The slider has a gradient background applied on it. This gradient is created using CSS. The gradient created using css is quite ineffective in IE, so we will use images for IE. We will have to add class="slider" to every slider we create to animate it later with jQuery. We will add another class="gradient_name" to each slider to apply color on it to make it single class <div class="gradient_name slider"> . We need to put the <div class="slider"> and the <div class="button color_name"> in a same <div> element so that the slider is positioned right below the respective button. We will create a <div class="column"> and put the <div class="button color_name"> and <div class="slider"> inside it. → Stylesheet to position the slider. Third class="column" for the container that holds both the button and the slider. We will also define Stylesheet for the links inside the slider. The background of the link turns white when the mouse hovers over them. The sliders have a fixed width and height. You need to adjust the height if you wish to add more links in it. The gradient is created using css, IE 8 and its previous versions supports gradients but to a limit. We can use IE specific Stylesheet Codes or use images instead on Stylesheet code for the slider background. Here are the images that have been used for creating the background. The jQuery code will animate the slider by sliding it vertically. We have also added some FadeIn and FadeOut using opacity. → This will add the toggle functionality to all the <div> elements with class="button". → This statement will get the value of the atttibute "class". → If the "Green Button" is clicked, the above statement will return "button green". → These are the names of two classes that were applied on the <div class="button green">. → button class for the Button Effect and green class for the green background color. → The fetched class name will be then saved in the variable clas. → This statement will replace the text "button" and the space from the variable clas, with "blank"
→ Then concat the remaining part with "_grad". → When the Green Button is clicked . → The variable clas will be assigned "button green" using statement on Line 6. → The Statement on Line 7 will replace "button green" to "green_grad". → The animate function will then animate it. → The animate function will change the opacity to "1" and change the position of the slider from "-143px" to "50px" which was set earlier in the Stylesheet code. → 500 is the speed of the animation in milliseconds. → Same functionality is used to slide the Slider back to its original position. → Only change is the css property in the animate function which will change the opacity to "0" and position the slider back to its original position on Line 11.